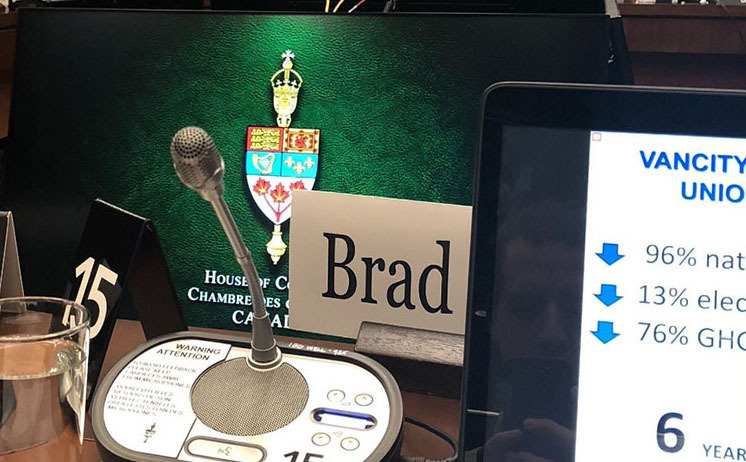 SES’ own Brad White, recently presented to the Standing Committee on Natural Resources at the House of Commons on the economic opportunities for energy efficiency in Canada. Brad began by highlighting SES Consulting’s projects to show how investment in energy efficiency does more than just reduce energy costs- it strengthens the economy. He showcased our ongoing work with The University of Calgary as an example, who are on track to achieve emissions reductions of over 24,000 tons with an anticipated cost savings of over $3 million per year and a return of investment under 10 years. Large projects like these have significant GHG reductions and energy cost savings, and stimulate local economies by employing trade technicians who implement the projects. In fact, the largest component of project costs is trade labour. SES Consulting’s engineering services are typically a small part of overall costs—20% or less, with the remainder going to the purchase of equipment. The economic opportunity in further developing Canada’s energy efficiency sector is at the local level by supporting jobs and reducing energy costs, and there is potential for a much greater impact if Canada continues to become a leader in the sector. With consistent government support through reliable incentives and regulation, we believe the sector will grow and Canadian expertise can be exported around the world. As Brad said in his closing words, “Simply put, being leaders and developing practical solutions for climate change is good for business”. Listen to Brad’s presentation here starting at 11:05:05.